on 15 April 2012 . 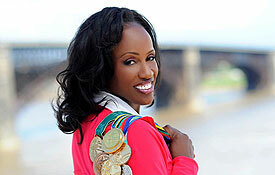 Thursday, April 19th, with a reception held at 5:30p and program commencement at 6p in the Anheuser Busch Auditorium (Cook Hall 050), we are honored by the presence of Jackie Joyner Kersee, Susan Goldsmith, Bruce Hudson, and Bill McDermott, in an insightful Olympic marketing symposium entitled “Marketing the Rings“. on 23 April 2011 . Took a lot of hard work, but definitely worth every second… We proudly announce the commencement of operations for the Saint Louis University (SLU) John Cook School of Business (JCSB) Sports Business program. Honoring us with their presence and contributions during our kickoff event were several top executives from the sport industry, and we are blessed to have many good friends and supporters joining our Advisory Board team for future directions of the program and our students’ tremendous benefit. Importantly, the work conducted around the days of the symposium in Alliance for Sport Business workshops, in regard to directions of the field and programs in Schools of Business, was simply outstanding and truly promising for the future. Wholehearted thanks to all who participated and celebrated with us! on 29 December 2010 . SportBusiness staff, readers, and Andy Brown (Editor, World Sports Law Report) nominate the most influential lawyers in the sports industry over the past year and explain why they made the list. The Sport Business International Journal is widely acknowledged as the most comprehensive publication for the international sport industry. Several updates on various projects and significant developments for our SLU Program, the Alliance for Sport Business, our collaborative research groups, and a host of promising opportunities we have been blessed with, to ensue over the course of the next couple of months… It will surely be a plenty busy and entertaining spring… We will all keep enjoying the learning process and contribution efforts. on 21 March 2010 . Update: New Call for Abstracts available as of Mon, April 4, 2010. See below and the ISLBC website. Also, peruse our colleagues’ May Istanbul international sports law symposium here. Dr. Kaburakis is cooperating with several academic and industry constituents, organizing the International Sport Law and Business Conference, to take place in Istanbul, Turkey, September 6-7, 2010. This promises to be an excellent gathering of intellectual capital, with tremendous potential for meaningful contributions to the field through the establishment of partnerships, quality publications, and mutually beneficial initiatives pursued by sport professionals. At times of extremes, intense hardship felt by this and most other industries, as well as the concurrent opportunities that trying times carry, there is no better venue to reach balanced analysis and carefully weighed recommendations than Istanbul, embodying the “bridge between worlds” since its founding. Do consider joining the outstanding group of colleagues that have been contributing research, reviews, and support in September. As you will realize by the Call below and after perusing the conference website, this is definitely a worthwhile venture, with a great deal to offer. on 20 October 2009 . Dr. Kaburakis was in Greece 9/30-10/6 for the American Community Schools (ACS) of Athens International Coaching Clinic and academic-administrative meetings in Athens and Thessaloniki. Bridges to Higher Education. Combining Education and Athletics. Administrators, Academic Advisors, Coaches, Parents, and Prospective Student-Athletes session. Various key constituents and administrators attended. Pleasant surprise to see approximately 80 attendees there. Everyone in this session contributed in making it a very informative, insightful, and enjoyable evening in view of assisting young student-athletes who wish to pursue both their academic and athletic dreams internationally. on 08 September 2009 . Dr. Kaburakis is assisting Annie Constantinides, Director of Athletics at the American Community Schools (ACS) of Athens, Greece, in planning and organizing the 1st ACS International Basketball Clinic, featuring top-level NCAA Division I Men’s and Women’s basketball coaches and Greek coaches with recent international competitions’ success in FIBA events. The clinic is accredited by the Greek Basketball Coaches Association and the Greek Basketball Federation.